Today's card is the Knave (Page) of Swords. 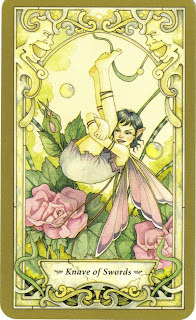 I used my Mystic Faerie Tarot deck...isn't the artwork playful? How do you know which one? That's where your intuition comes in. Read the following clues to see how this card applies to you and your life. When something hits home for you, that's your intuition talking...listen up! If this card symbolizes a person in your life, it may be someone who is younger than you (in either age or maturity level); they may be learning something new (swords indicate intellectual and mental qualities). It may be a precocious or clever child, someone who is energetic, curious, bright, inventive and enjoys exploring things intellectually. If a person immediately comes to mind (you get an intuitive hit), chances are that you may need to dedicate some time and attention to this person. It's not a random occurrence that this card came up for you. Spend time enjoying this person, getting to know him or her and make a special effort today to reach out to him or her...even if only to let him/her know you care. If today's Knave of Swords refers to you and your personality, it may indicate that you have the opportunity to learn something new or are eager to explore a new interest. If you've recently noticed a feeling of passion and energy, take this as a sign to step forward and see what's available for you. Your passion and inspiration is a sign of being "in spirit" or purposefully driven forward. What is it that you want to explore? This card encourages you to take one (baby) step towards your passion to move you forward. Do it today! If today's card refers to is a situation, the Knave of Swords might indicate some type of communication (a letter, email, phone call or notice) about something that's been on your mind. This card can also give you a heads-up that information may come that you may not initially like -- but know that the card also predicts that if the news at first seems upsetting, take ten deep breaths and be glad to know that the message of the Knave of Swords may appear upsetting, but it will quickly disappear from your life. So don't waste time getting upset. Let it run its course and see what happens. Court cards can seem complex, but my guess is that reading through this information, you already know what messages were here for you today. If not, be alert throughout the day and see what comes your way. If so, take this information and move forward...one step at a time. And...let me know how it goes! This card is perfect for me today, as I am befriending a young, intelligent woman I work with...who has a drinking problem. We are going to the Boss together this afternoon to talk about her plan to work with this addiction and to thus keep her job! I immediately thought of Ana, my daughter. I can even see her in the card, she just exudes the energy of that card, lighthearted, energetic, and full of curiosity. Last night Matt and I were discussing that Ana has been getting a lot of awards at school, and I asked, "What is she doing to be recognized so much?" Matt replied with, "The right things." We were talking about how we need to spend more time with her and guide her in order to continue this wonderful path that she is on. How funny to wake up and see this card as more of an affirmation that she is in need of a little special attention right now. It is easy to see my 2 yo daughter in this card. She is developing into a wonderful little person with a fierce intelligence and generous spirit. Watching her grow is amazing, and I want to soak it all in. Big changes may be coming into our lives, and I don't want to miss anything with her. I also feel a surge in my own creative spirit, and I've been acting on it this week by finishing projects and picking up on old ones. I'm also eager to move forward with some new creative ideas. Definitely my older son, my little knave, who is reluctantly learning executive functioning--from an inept teacher (moi). I'm certainly trying to keep the best light possible on this...that I'm on his side, and that whether or not he excels in the content,the underlying skill is the true prize of this learning. Unfortunately we often fall into a pattern of conflict over it. And usually when I'm trying to teach something to one of my sons, I find it applies to me, too. I get a smile when I look at this card. I remembered yesterday your "Eight by 8" checklist, and I started doing my own this morning. T, my little knave, loved it! It channeled her playful energy into the game of getting ready for school. Who knew she'd like checklists? For me, the card would represent my son Gabe. We are currently having a major power struggle because this incredibly bright, wonderful kid has decided he WON'T potty train...ugh. My daughter: bright, intelligent, full of excitement about auditions for the 5th/6th grade play going on this week. She needs more of my attention, especially in the form of support developing some of those executive organizational skills Excavator was referring to, and also the appreciative kind. Interesting how everyone related this card to a person...I did, too. I immediately thought of my oldest niece, who hasn't had the easiest life and is being raised by my parents. I so often wish I could make things better for her. "This card can also give you a heads-up that information may come that you may not initially like..."